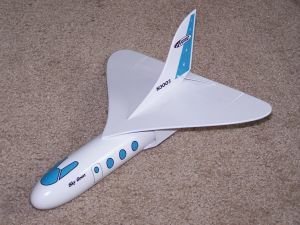 This is a Goonie of one my favorite classic boost gliders, the Sky Dart. The Sky Goon starts as a Baby Bertha and adds wings, stabilizer and engine pod. The rear of the nose cone is removed, leaving about 1/2" of shoulder which is glued to the body. The engine mount is built as usual with the aft centering ring positioned 1" from the end. The other two rings are glued together and attached 3" from the forward end. Four vent holes punched in the forward section and bulkhead is formed with one of the engine blocks and a thick piece of card stock. CA glue was soaked into the edges of the 60-20 centering rings, which were then sanded smooth. With the back of the nose cone removed, the engine pod can slide as far forward as possible. The lead weight is added to the forward compartment created by the bulkhead in the pod and secured with epoxy. The elevator retention wire is formed and epoxied to the end of the pod. The wings were downscaled from the original, but was given a proportionately larger elevon. Using 4" wide 3/32" balsa stock allowed me to make the wing with only 3 separate sections. The elevon was cut out and reattached with the Tyvek paper hinge. 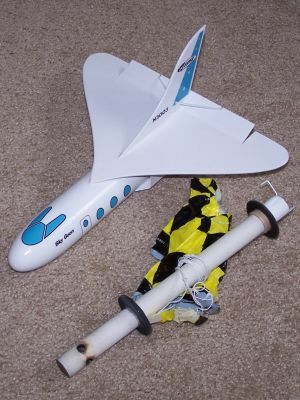 The wing and vertical stabilizer were glued on and launch lugs were added under the wing to give some reinforcement and provide spacing for the jet nacelles. The nacelles were formed from a double layer of 110lb cardstock and affixed to the body. All parts out of the bag were pristine. Unlike most of the Goonies I've built, this need a lot more parts from my own supply. Finishing went smoothly. I printed my own waterslide decals using my ink jet printer and decal paper from Micro-Mark. I used laser cut centering rings from BMS rather than the stock rings as I wanted something a little sturdier for the engine pod. I love the way this one turned out, definitely one of my favorite Goonies. B6-2 and C6-3 are the recommended motors for this bird. The first two flights were with the B6-2 and both were nearly identical. Very straight boost with ejection of the engine pod at apogee. The pod returned on the stock Estes chute with a spill hole. The glider came down in a nice circular pattern and made a clean landing. The third flight was on a C6-3. It's a good thing my flying field is pretty large as, once again, I got a straight, clean boost. It separated just short of apogee, and while the pod returned pretty close to the pad, the glider decided to wander a bit. It stayed in sight all the way, but I still had a bit of a hike to retrieve it. I think I'll mostly stick to the B6-2 for this bird. This was a fun kit bash. A great performer as well. PROs: Cute as a button. Flies well, both in boost and glide. Very enjoyable to build. CONs: The Estes ejection charges a doing a number on the exhaust ports on the engine pod. I'm going to have to add some reinforcement if I expect it to last.